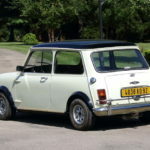 I recently purchased a 1968 Morris Mini Cooper S that was originally purchased in France. I know it had the same owner from 1968 until 2005 when it was sold at an RM Auction in Amelia Island. I purchased it from the winner of that auction however all of the records had been lost. It still has its original French license plates along with much of its original equipment. Would love to know if one of the two prior owners listed in the in the Mini Registry.